And in German - Mandelsterne. A funny thing about these this year. The food editor in our local paper had an invitation out to readers to send in stories about learning to cook by watching, say, their mothers or grandmothers. I sent in a little story about these cookies, explaining that they were my then-boyfriend's favorites and so one evening I learned to make them by helping her. I missed they deadline by two days, but they posted the story anyway, and the recipe. And this year - when I made them - they didn't come out so well. Figures, huh? 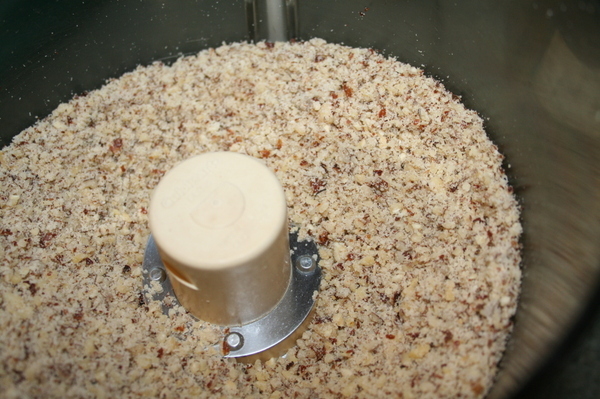 * Grinding the nuts - I used a food processor this year instead of the meat grinder that I used in past years (because Bill's mom used a meat grinder) - and I like the processor method MUCH better. It's fast and tidy and fast. 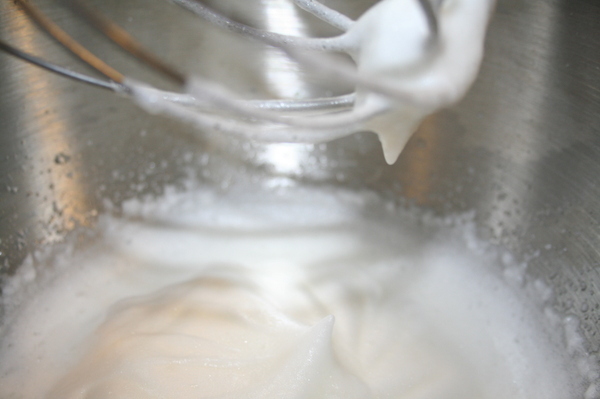 Place your egg whites in THE EXCEPTIONALLY CLEAN AND DRY bowl to your mixer and whip to stiff peaks. Add in the confectioners' sugar and beat until very stiff. 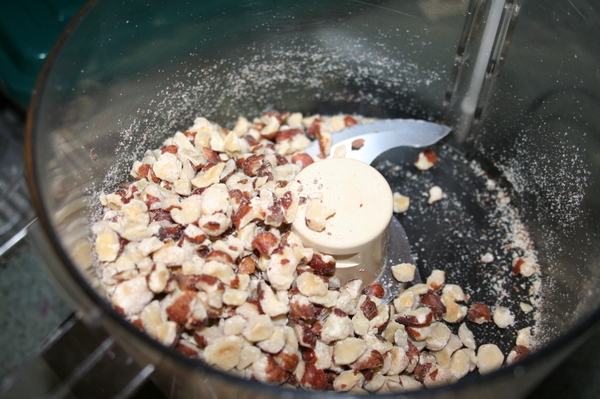 Then fold in the almond extract, lemon zest, and nuts. 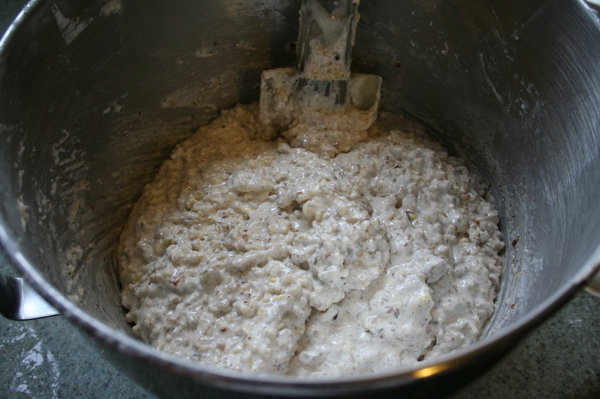 Chill the dough for at least an hour. Now, on a clear work surface, sprinkle some confectioners sugar or granulated sugar. A good amount. You DO NOT want to use flour for these. They don't have flour in them, for one thing. So use sugar instead. 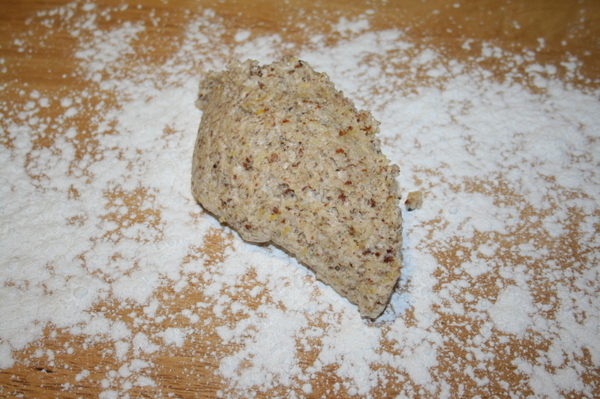 Scoop out a small amount of the dough and put the rest back in the fridge. 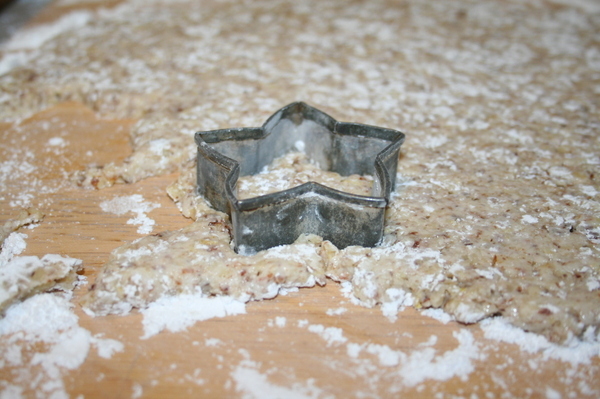 Very carefully - it's fragile stuff - roll out the dough to about a quarter of an inch thick. 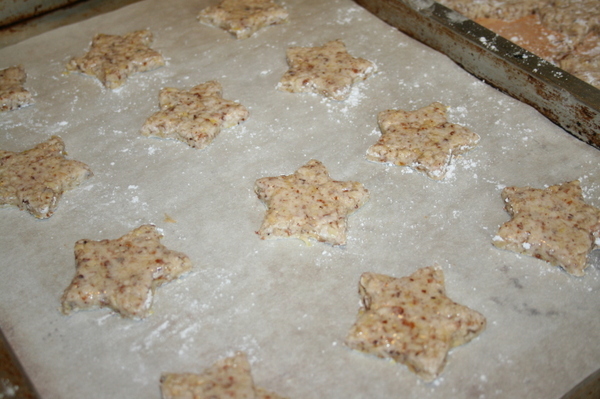 Dip your star-shaped cutter in some sugar and cut out enough stars for one cookie sheet. 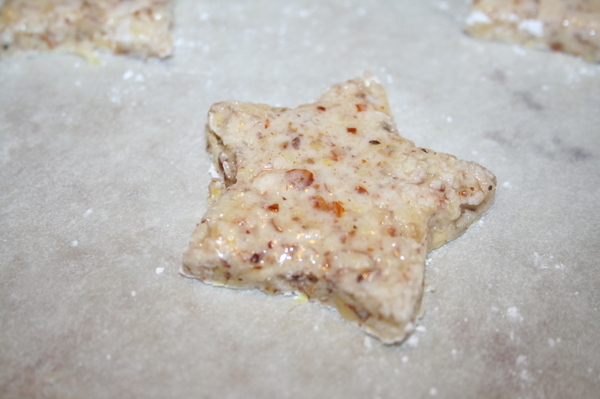 Now get those 4 T of egg whites you set aside earlier, and gently glaze the top of each star with a little of the white. It gives them a nice thin "crust" when they bake. But look - in this next picture (from 2006) - in the upper right corner - THOSE are almond stars in their proper star shape. I CAN make them correctly. I really can! And actually those are all 6 of the German cookies. 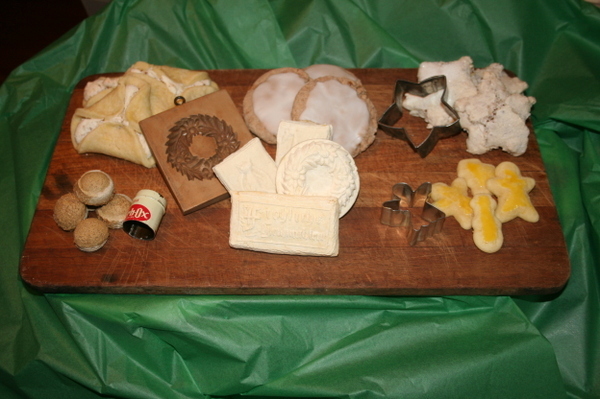 L-R, back row - Farmer Hats, Lebkuchen, Almond Stars, front row - Pfeffernusse, Springerle, and German Butter Cookies. 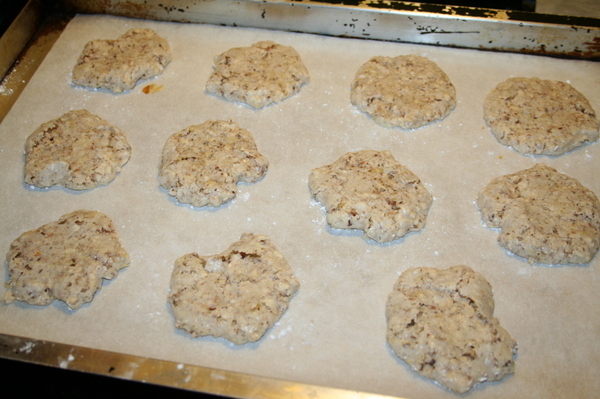 OH - and most important of all - bake them on PARCHMENT PAPER on your sheet pan. Otherwise they will stick and you will tear your hair out in frustration. They're very tasty (no matter what they look like) - they're basically meringue cookies with ground nuts in them. Crispy outside, chewy inside. VERY sweet.